The Glenlivet 12 year versus the Glenlivet 15 year, which one is better?…… Trick question, those who answered one or the other need to stick around to read why. It’s commonly assumed that the older the whisky is, the more that it should cost and therefore means the better it is. This couldn’t be further from the truth. If there is anything that you should learn today, please let it be that, “Age ain’t nothin’ but a number”. Yes, the older a whisky is, the more expensive it should be, because after factoring in time and the angel’s share (evaporation of whisky from the barrel), less whisky is actually in the barrel, therefore the need to sell it at a higher price to make the same amount of profit from less liquid. But that doesn’t mean anything about it tasting better. The Glenlivet 12 (G12) and 15 (G15) are completely different whisky’s with very different flavor profiles and aromas. 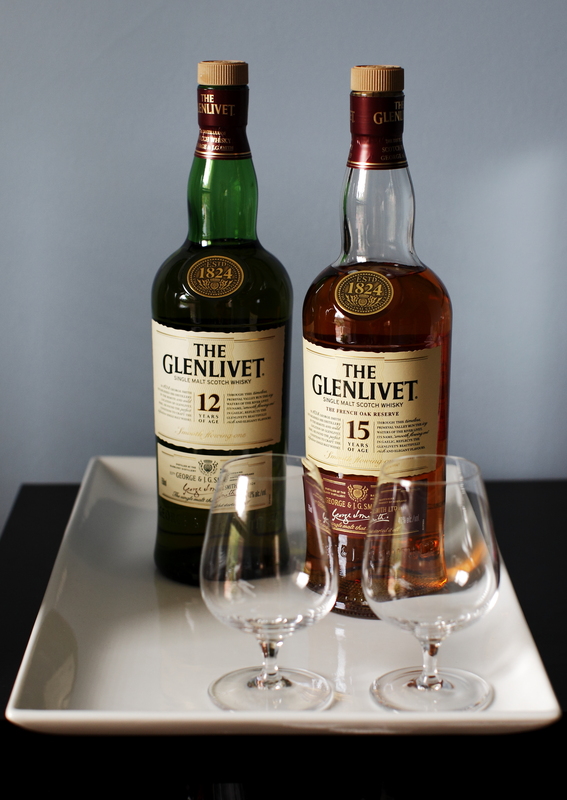 Don’t think of them as competing against each other but rather, another flavor within the family of Glenlivet to try. Color: The Glenlivet 12 is close to a lightly toasted wheat and pale yellow. The Glenlivet 15 is more of a medium Oak color and lightly orange in the glass. Nose: The G12’s nose is full of fruit flavors! You’re immediately blasted with a rainbow of aromas, pineapple, white grape, kiwi and gobs of tropical white fruit smells. The juice, most certainly, is loose. Then a light amount of white pepper, the fresh smell of a new wallet and light oak. Going in for another nose, an under-ripe granny smith apple and floral qualities appear. The G15 is a completely different beast, but just as alive and layered. Opening the bottle I immediately smell fresh oak, round vanilla and sweet Sherry. There is a artificial peach aroma, like that of gummy peach rings, followed by molasses rich brown sugar and buttery toffee. Rich. Palate: The G12’s mouth feel is light and not oily, like a racy sauvignon blanc. A light spice fills the mouth with a cereal breadiness. Vanilla, floral like a chamomile tea with dried orange peel in the background. The G15 features toasted pecans and lime on the palate with a light oak bringing roundness. A honeyed licorice candy lengthens into a drying cocoa. Blonde coffee with vanilla and toffee flavor without the sweetness keeps me curious for another sip. Finish: The G12 finishes a little sour and a tad tart, with a trailing light spice. The G15 finishes with spiced vanilla and toasted nuts and a hint of mint or menthol. After reading this review you can see that these two scotches are completely different and can’t really be compared. If you’re looking for a tropical fruit sensation with a clean citrus nose and light spice and freshness, go for the Glenlivet 12. If you want more fall type spices, with rich vanilla and toasted nut flavors, then you would definitely go for the Glenlivet 15. Remember that a brand’s lineup isn’t always about getting better with age, but rather changing with age.